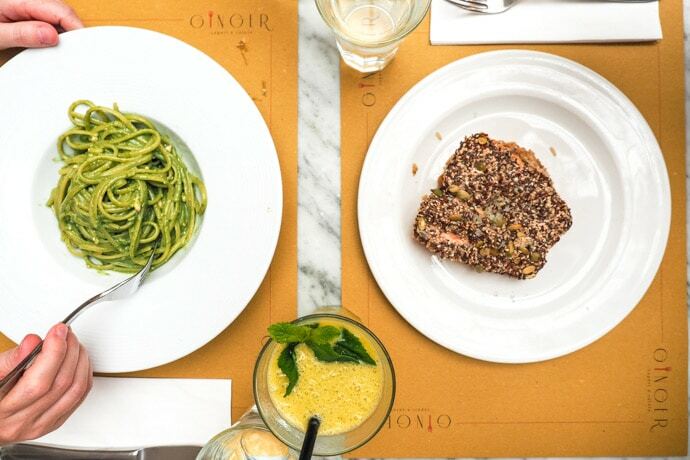 It’s no secret that Italy has absolutely delicious food, and Rome is a great place to taste the Italian cuisine. 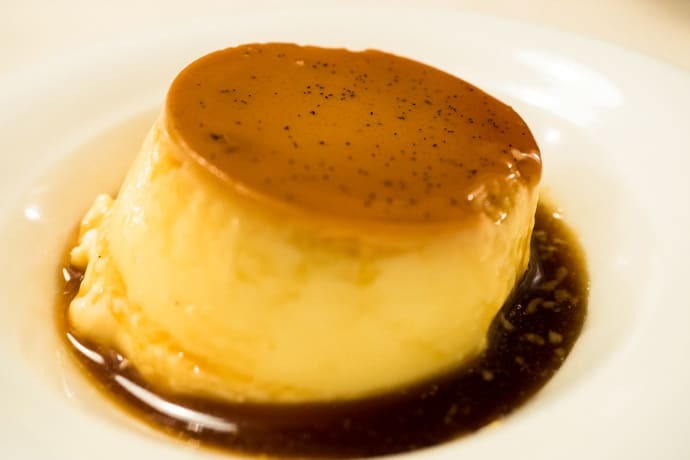 We’ve had the best creme caramel and carbonara we’d ever tasted in Rome. Pasta dishes we didn’t even know existed. Pizza that had little resemblance to what we knew. Most days involved coffee and gelato. 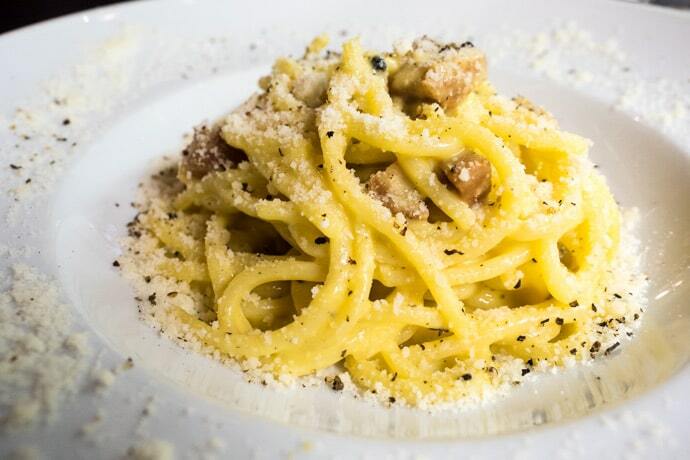 After spending over a month in Rome, here are our favourite picks for where to eat in Rome. 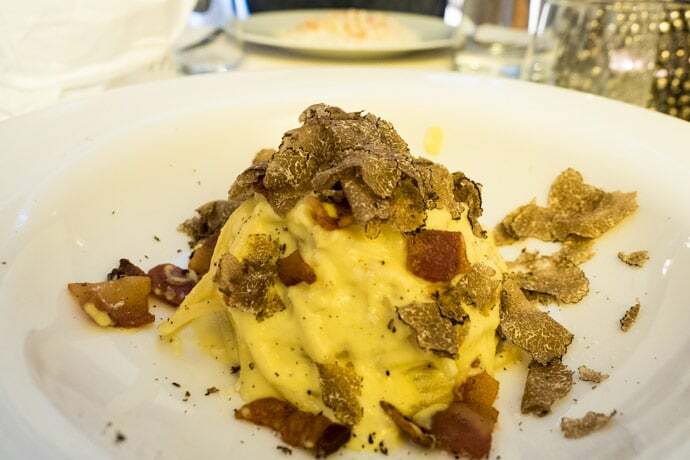 Roscioli is one of our favourite restaurants in Rome. Actually, it’s not just a restaurant, but a deli and wine bar too. The best carbonara I’ve ever had is from here, tasting it was like suddenly realising I’ve never really had carbonara before. We also love the Amatriciana pasta, mozzarella hamburger and cheese plates. Be sure to make a reservation in advance. They also have a bakery and a coffee/patisserie at other nearby locations too (see below). A fine dining experience that also manages to be cozy and comfortable. 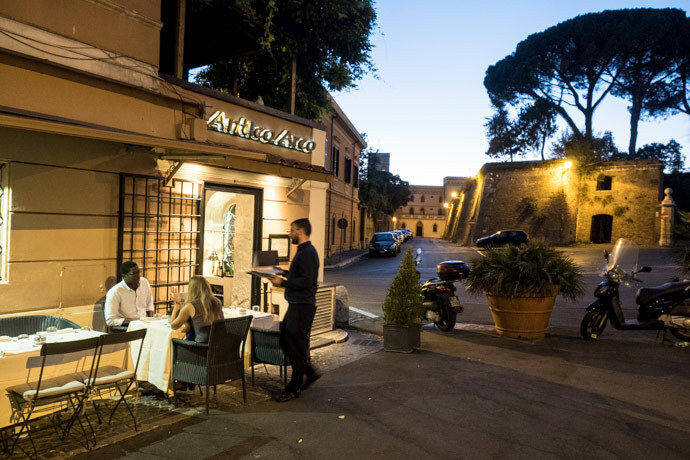 Antico Arco is a beautiful restaurant on Gianicolo Hill serving modern takes on traditional Italian food. Chris had risotto with snapper ceviche and I had carbonara with truffle. 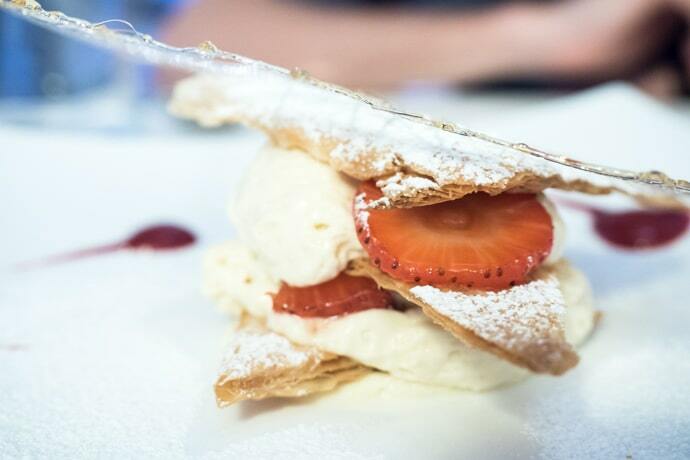 For dessert we had the sfoglia tiepida with puff pastry, sabayon and caramelised strawberries. It was absolutely delicious from start to finish. 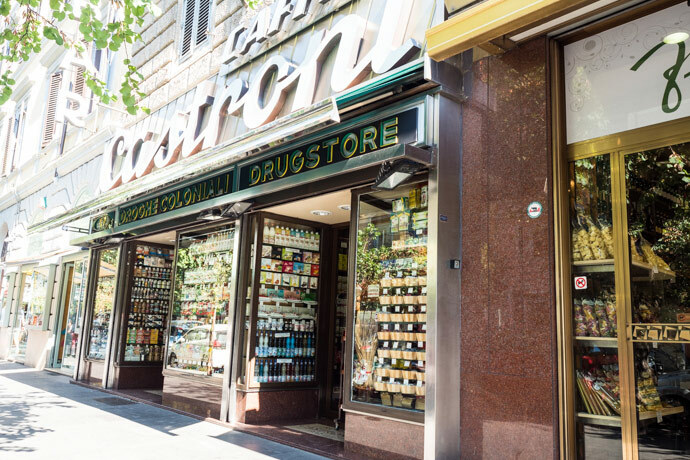 Armanda al Pantheon is centrally located right near the Pantheon, but don’t let that fool you into thinking it’s a tourist trap. 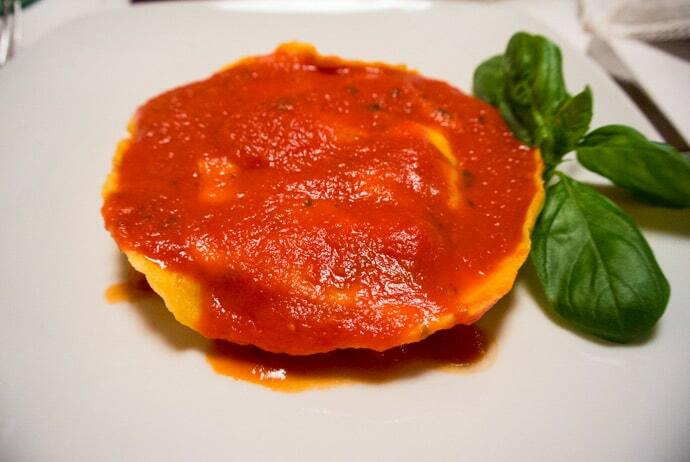 Serving traditional Italian cuisine in a cozy trattoria setting, come here for an authentic experience. 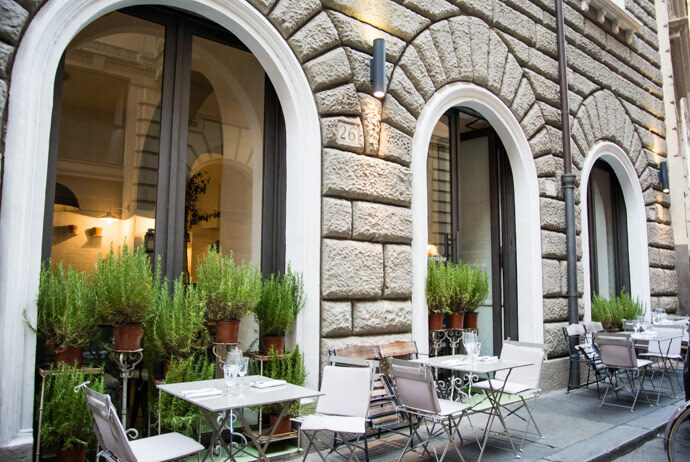 Da Cesare is a traditional trattoria with a neighbourhood feel, serving traditional Roman cuisine. I love the fried gnocchi with cacio e pepe, the pasta dishes are delicious and the creme caramel is possibly the best I’ve ever had. 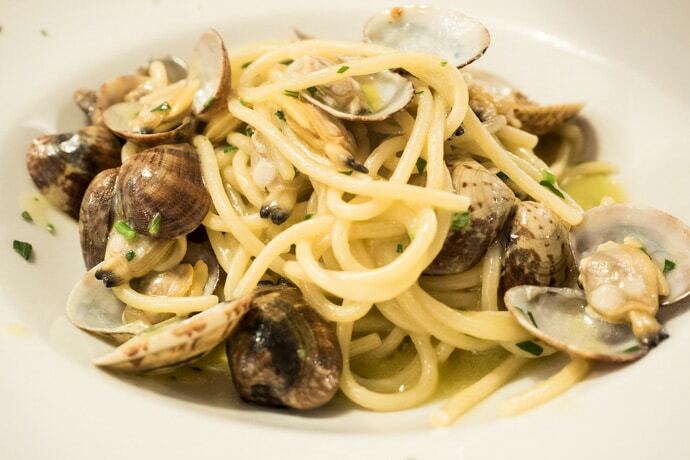 We absolutely loved Trattoria Monti. Chris had rigatoni with sausage and I had tortelli al rosso d’uovo, a large raviolo with egg yolk with ricotta and spinach with a red sauce. They were both delicious, as was dessert. Come here to taste traditional Roman cuisine. 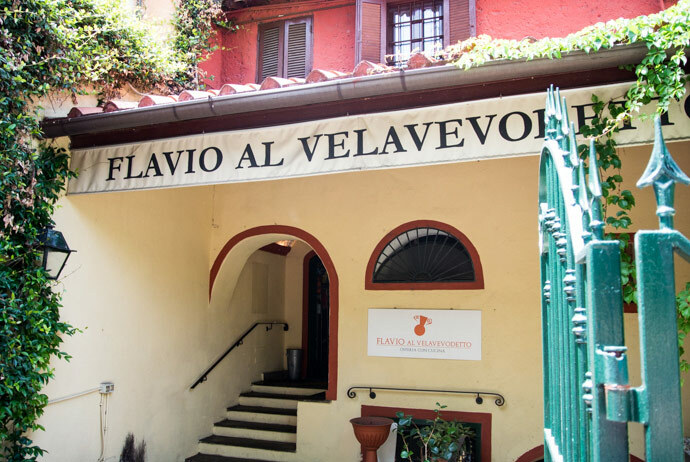 Flavio al Velavevodetto is located in Testaccio and Prati. Ginger is open from breakfast til dinner serving healthy yet delicious meals. The focus is on healthy meals that taste good, and 70% of their ingredients are organic. It’s a really nice atmosphere, but can get quite busy so try to make a reservation. 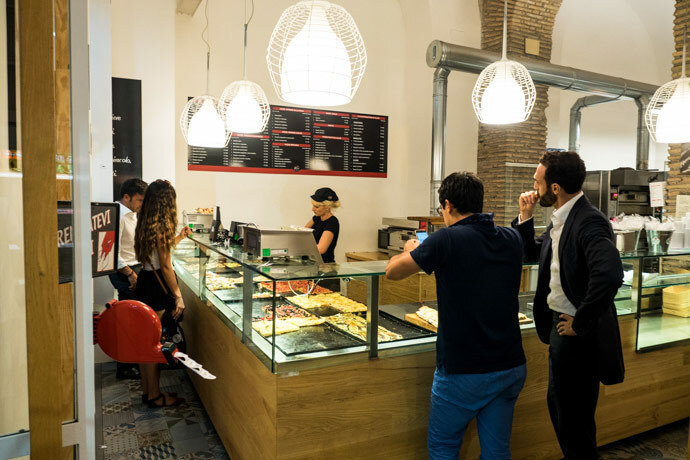 A great alternative to other picks for where to eat in Rome. 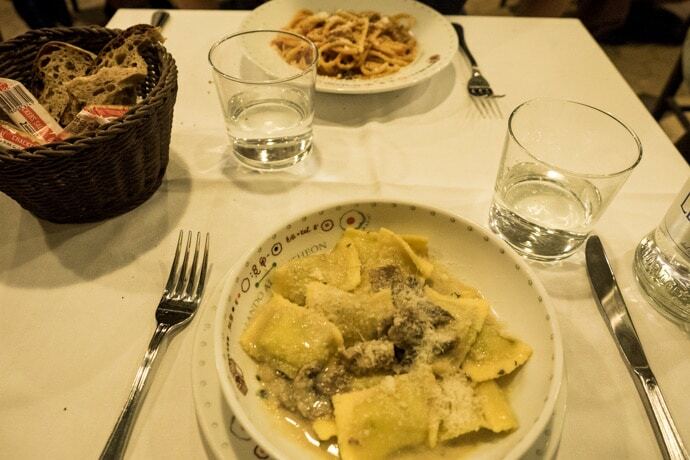 If you have only a short time in Rome I would choose to go to some of the other ‘where to eat in Rome’ picks. But Angelina a Trevi is a good option near the Trevi fountain and also has a cafe next door. 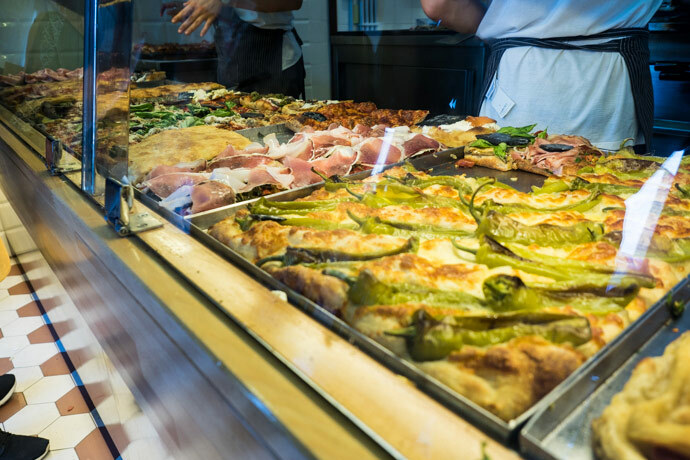 When you think of where to eat in Rome, pizza surely comes to mind. 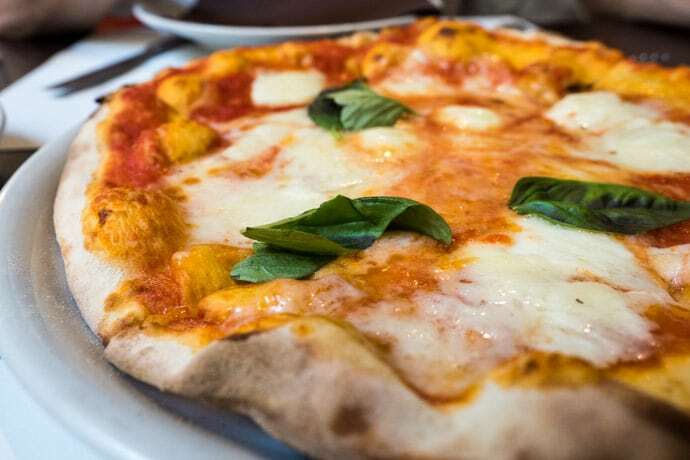 Pizza in Rome comes in two main varieties; by the slice and as a whole round pizza. 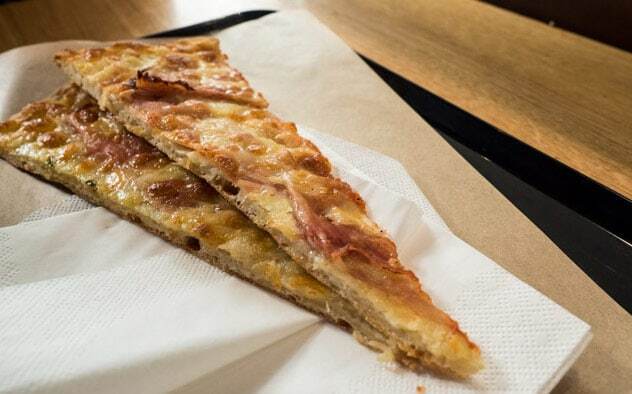 Pizza by the slice is more common for lunch and is usually cut and weighed. 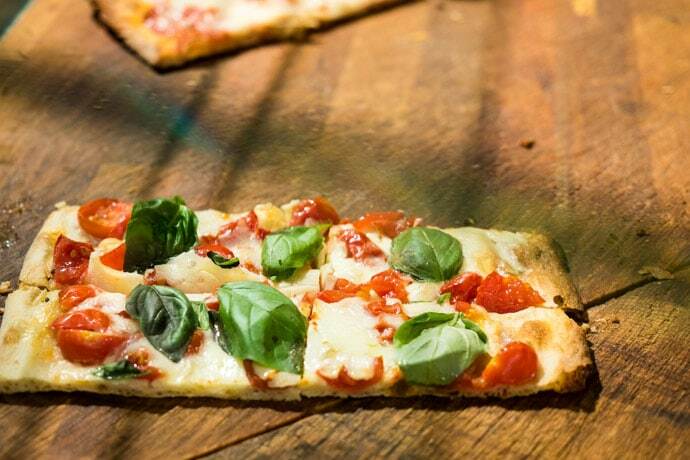 Whole round pizza is more often had at dinner. 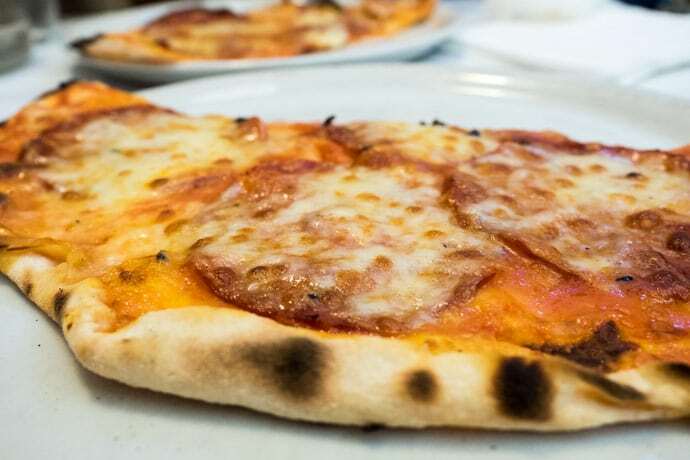 Pizzarium is known to be potentially the best pizza by the slice in Rome. It’s absolutely delicious, with a range of toppings available. 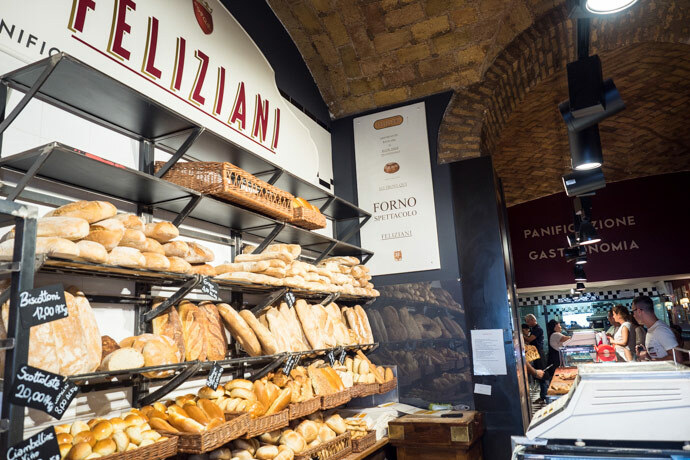 The bakery arm of Roscioli, they have great pizza by the slice and lot’s of other bakery products you’ll be tempted to buy. 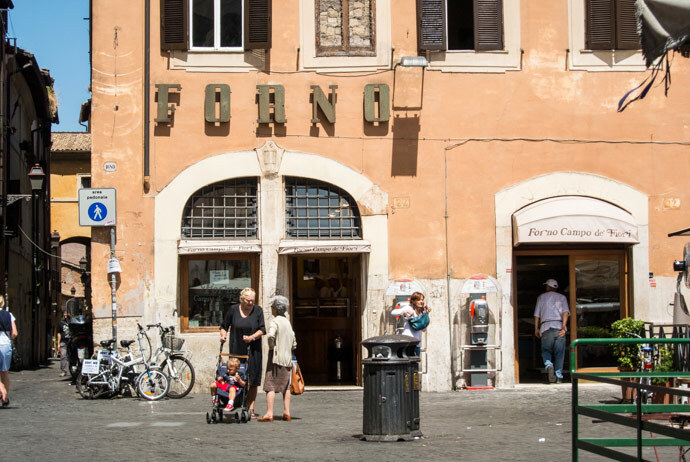 Conveniently located on Campo De’ Fiori, Forno is a traditional bakery with pizza by the slice and a range of other bakery products. This was one of our locals and it has great pizza by the slice, the zucchini toppings were my favourite. They also have great Limone cake! 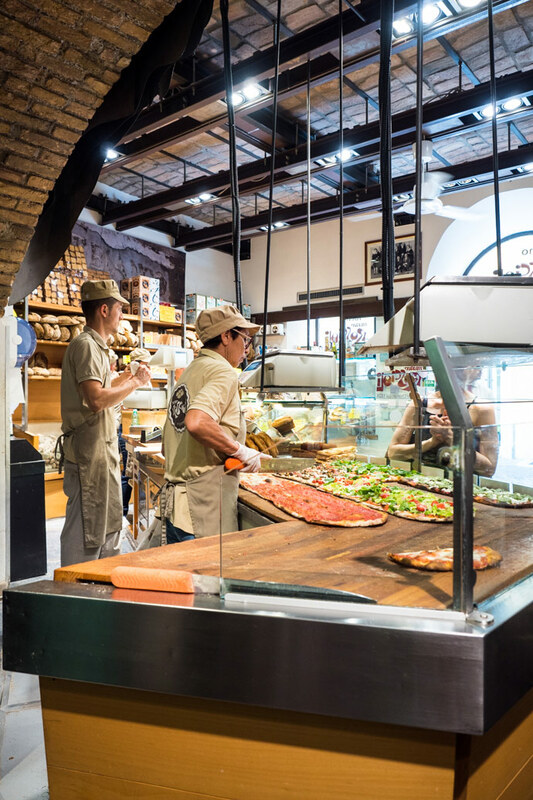 More of a pizza chain but Alice have high quality pizza and toppings by the slice. 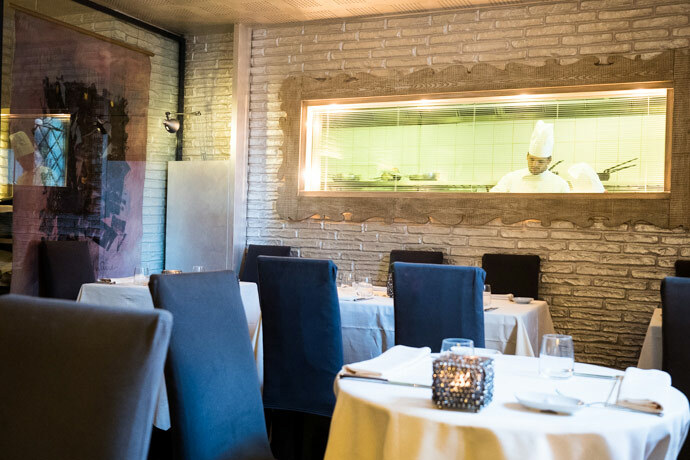 Da Remo is a relaxed restaurant in Testaccio. 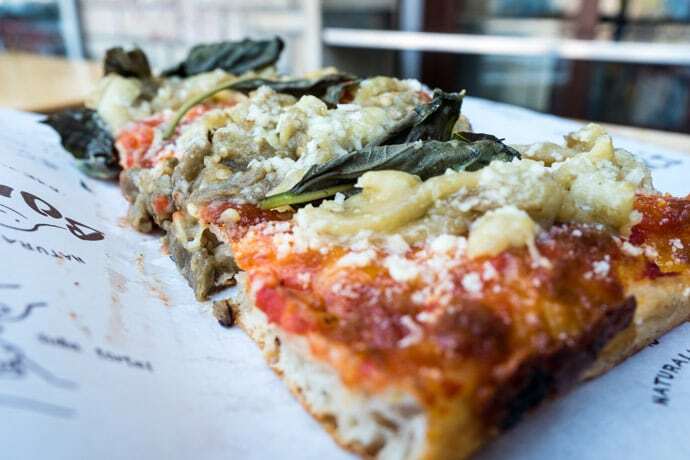 They have great pizza and other traditional dishes. Emma is a great restaurant that is more than it first seems. If you walk inside and downstairs there is a whole other section which has a beautiful interior. The pizza here was absolutely delicious and it’s nice to have pizza in a restaurant environment. 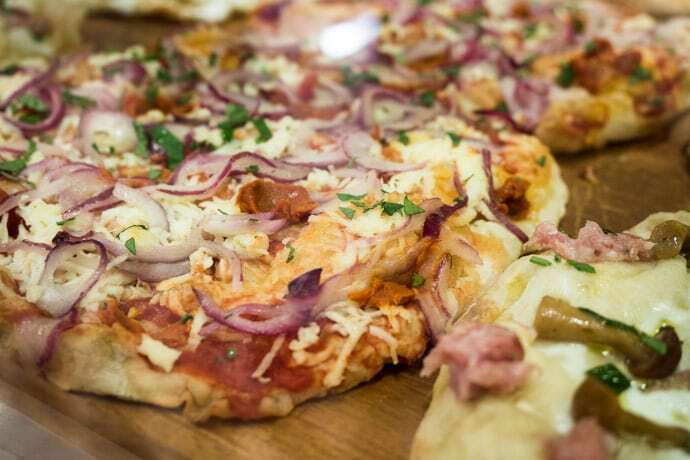 Giselda has a little bit of everything, bakery, pizza, deli, cafe, bar. They have great food and nice environment in Trastevere. 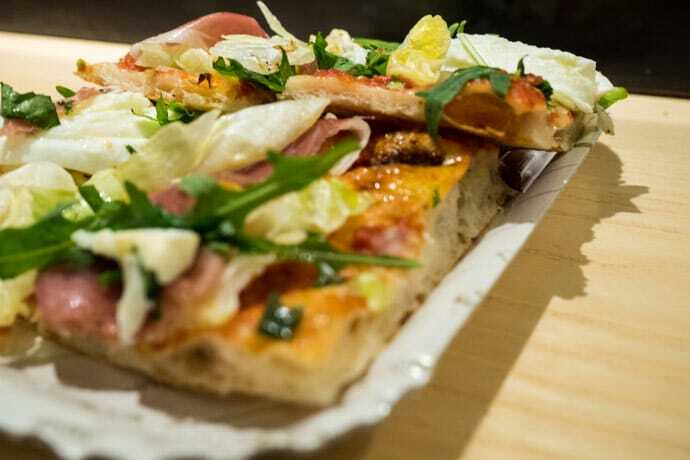 Pinsere is a very popular eatery serving pinsa, which are very similar to pizza but not exactly pizza. The best way to discover what this is, is to go there and try it for yourself. They are delicious. 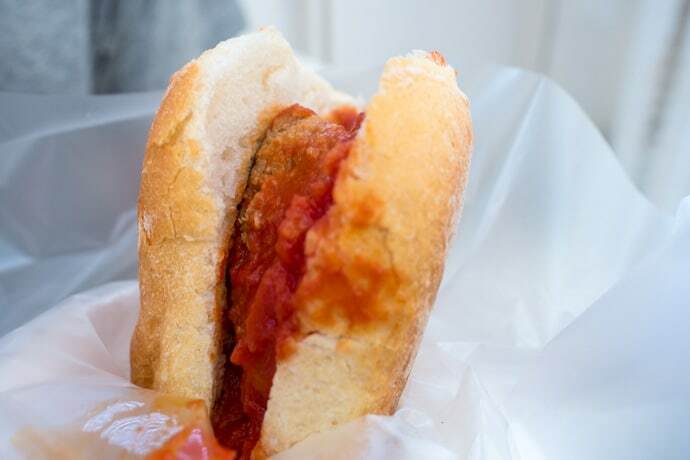 A stall at the Testaccio markets, Mordi e Vai serve sandwiches with traditional Roman cuisine for fillings. 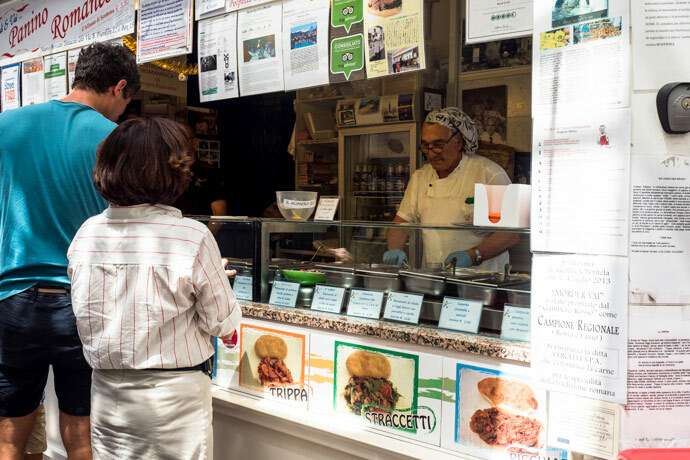 A simple but tasty shop selling sandwiches, we love the porchetta ones. Perfect for when you don’t feel like a restaurant meal. 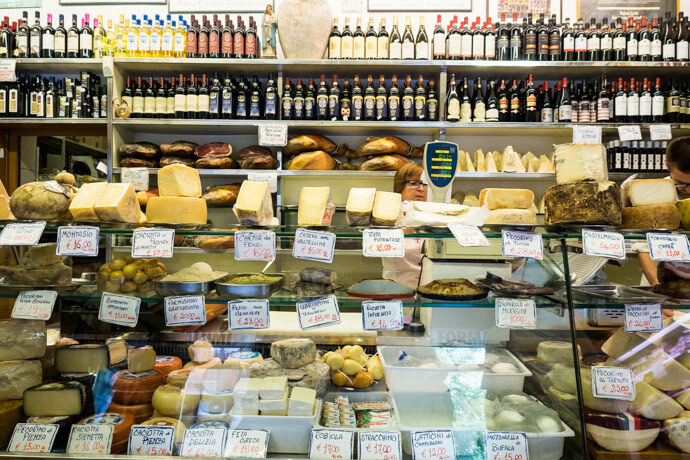 Where to eat in Rome is not restricted to restaurants. In fact, you can get some delicious food at the markets to eat there, or to take home and cook with. 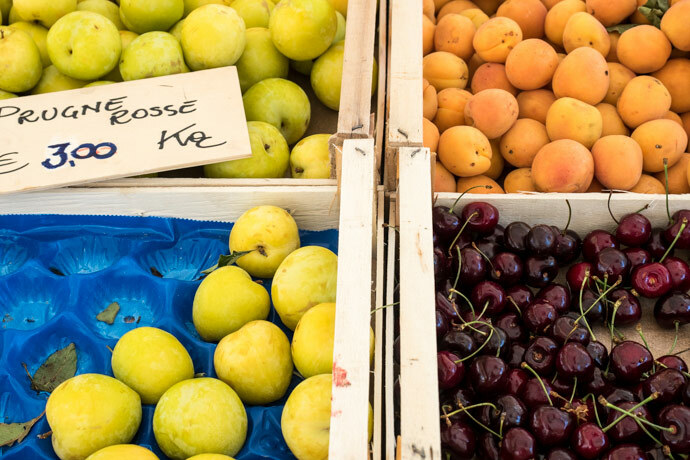 The Testaccio Market has fresh produce, food stalls, drinks and dessert among other things. Definitely worth some time or for a bite to eat. 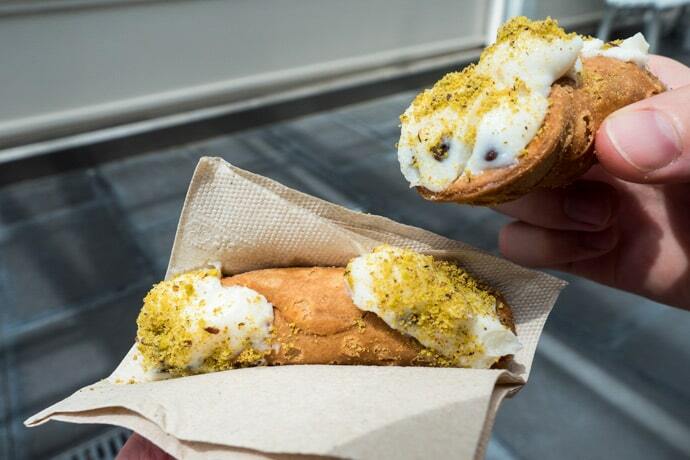 See Mordi e Vai for sandwiches and also Food Box has some great cannoli. This covered market in Prati is quite large. 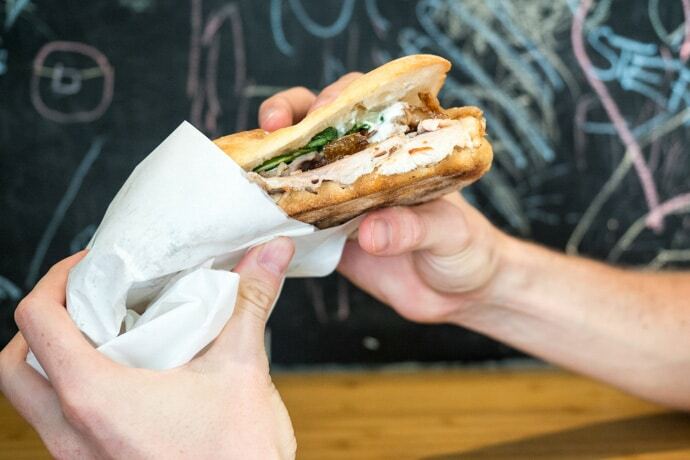 From fresh produce to freshly cooked porchetta, it’s worth a look. 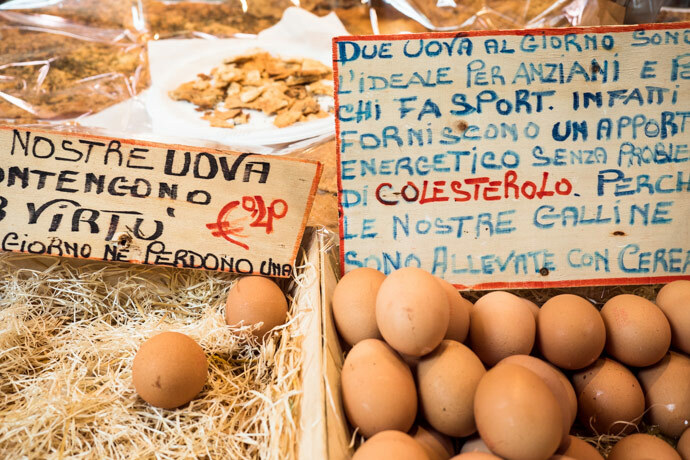 Although a little touristy, its one of the most centrally located markets in Rome with a great atmosphere. 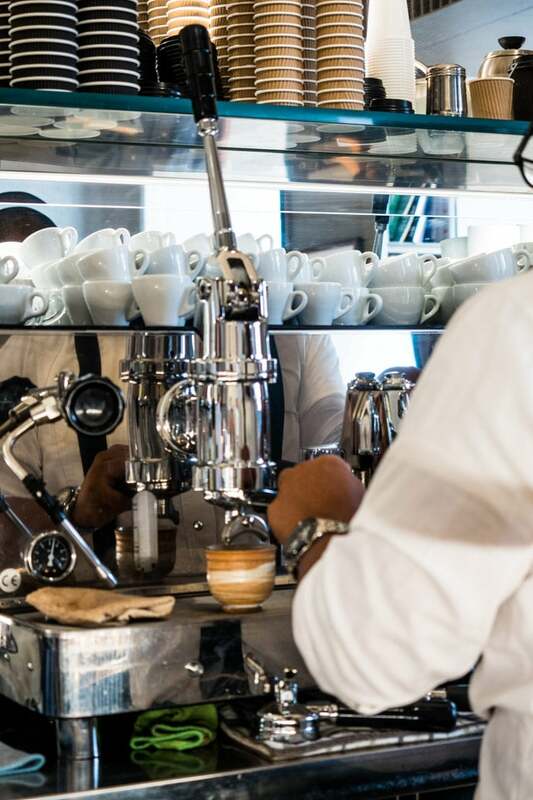 This is what I imagine it would have been like to get coffee in Rome in another time, it’s classic and beautiful in design and service. 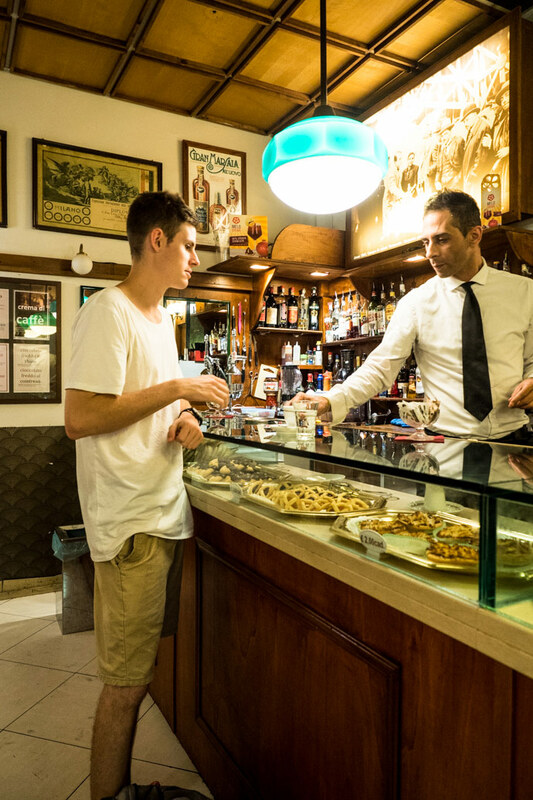 An iconic caffe in Rome with a range of different coffees on offer. We tried to il tiramisu, which is an espresso with creme and chocolate powder on top. So good! 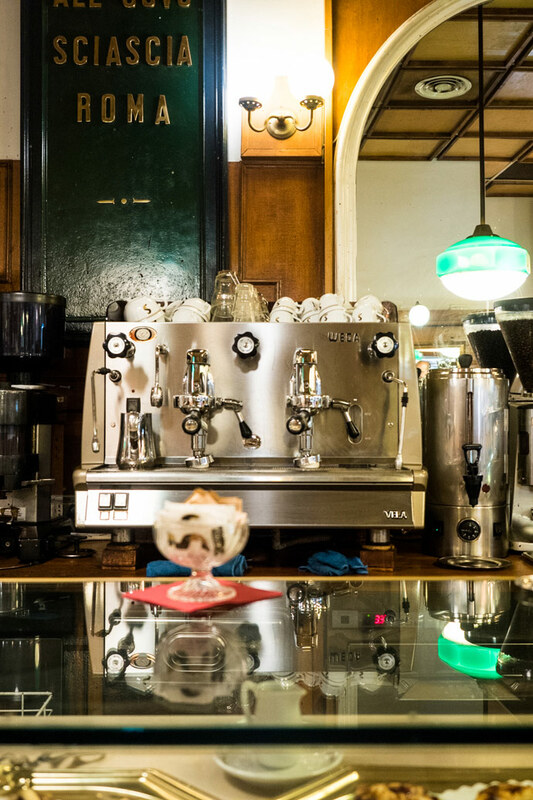 Another classic coffee shop in Rome, known for their coffee granita with whipped cream. A great experience but perhaps the granita is slightly too sweet. 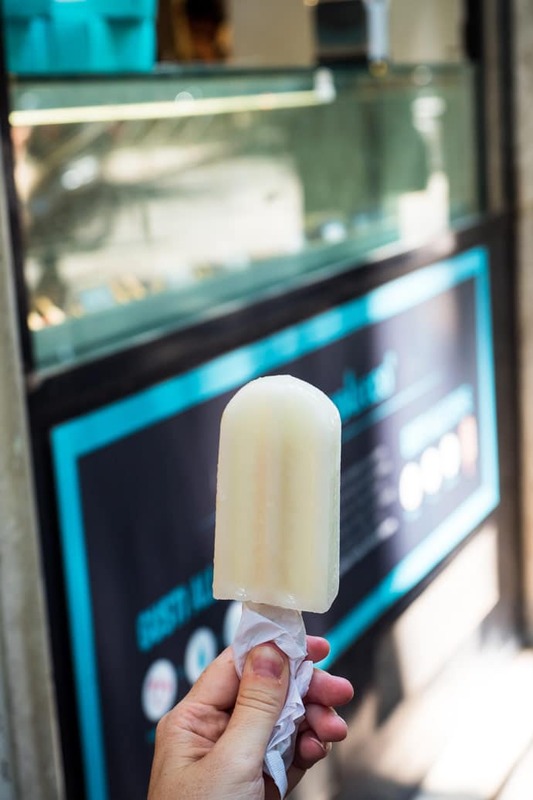 Steccolecco are ice blocks and gelato on sticks made from all natural ingredients. They have a section in Giselda in Trastevere, as well as stand alone stores. 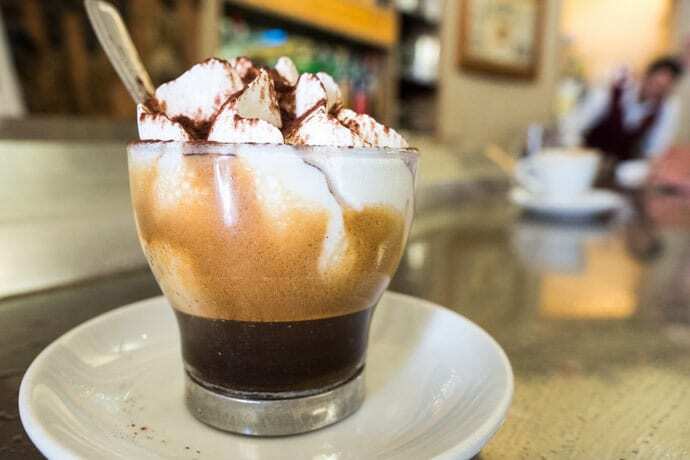 Beautifully designed, Roscioli Caffe is a great place to come for coffee, sweets or small bites. Biscottificio Innocenti is down a quiet little street in Trastevere, on the less touristy side. The shop takes you back in time, where you can stand outside peering into the windows to look at all the ‘biscotti’ or biscuits. Simple yet delicious. 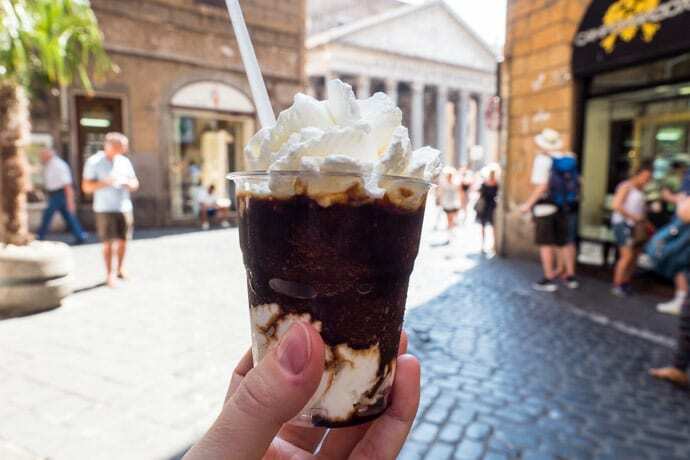 There are so many absolutely delicious gelateria’s in Rome, you will be wanting to have gelato everyday. 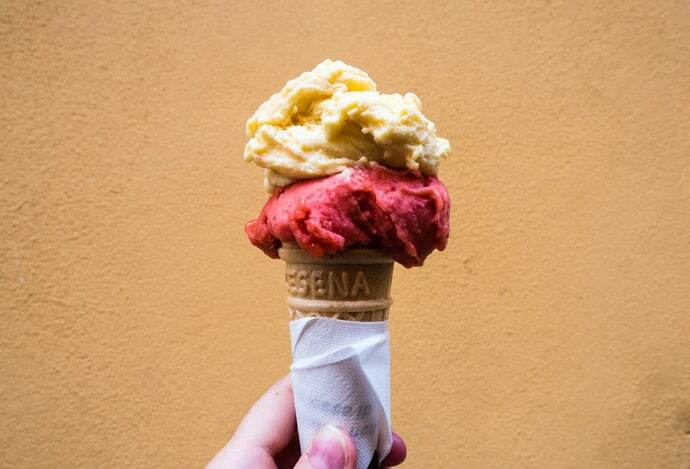 Here’s where to find the best gelato in Rome. Here they have coffee, bread, pizza and plenty of pastries to choose from. 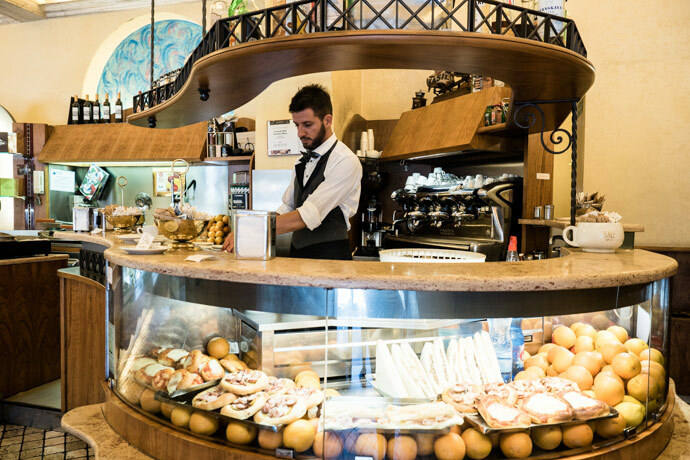 Come here for coffee and pastry goods when you’re in Testaccio. A traditional food shop selling food and cured meats along with some other specialty food. Really friendly service and excellent quality goods. A speciality food store selling packaged foods and also has a coffee bar with snacks. 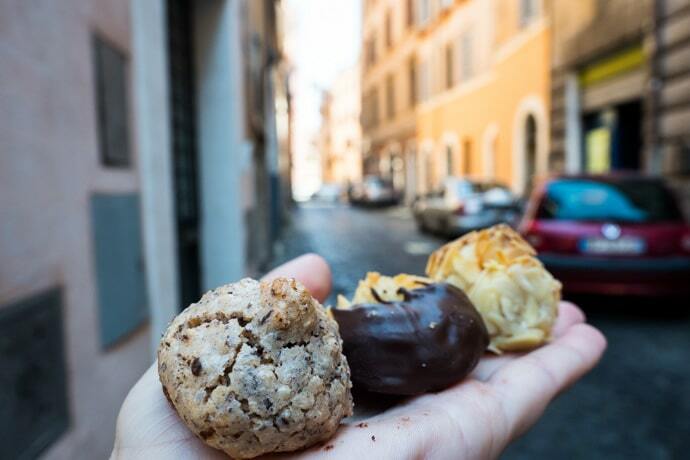 So that’s our favourite picks for where to eat in Rome… what’s your favourite?